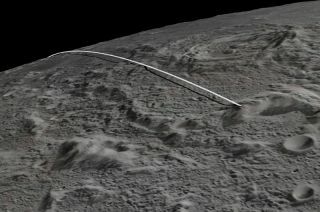 A NASA probe recorded a spectacular flyover video of the moon's far side shortly before intentionally slamming into a lunar mountain last month. NASA's Ebb spacecraft shot the stunning final moon video on Dec. 14, just three days before it and its twin Flow ended their gravity-mapping mission, known as Grail, with a dramatic crash near the moon's north pole. Ebb was just 6 miles (10 kilometers) above the lunar surface when it captured the images using its MoonKAM (Moon Knowledge Acquired by Middle school students) camera. The probe was skimming over the far side's northern hemisphere at the time, near an impact crater named Jackson. Grail scientists pieced together about 2,400 individual frames to make the nearly two-minute video, NASA officials said. The $496 million Grail mission — short for Gravity Recovery and Interior Laboratory — launched in September 2011, and Ebb and Flow arrived in lunar orbit about three months later. The washing-machine-size spacecraft spent a year zipping around the moon, detecting the tiny changes in the distance between them caused by lunar mountains, craters and subsurface mass concentrations. The Grail team used these super-precise measurements to construct an incredibly accurate map of the lunar gravity field — the best ever created for any celestial body, researchers said. But Ebb and Flow couldn't keep flying forever. They were running out of fuel by last month and would have crashed into the moon eventually, so the mission team decided to bring them down in a controlled fashion, far from the Apollo landing sites and other areas of historical importance. So on Dec. 17, the two probes slammed into a crater rim near the moon's north pole. Shortly after the impact, NASA announced that the crash site would be named after the late Sally Ride, America's first woman in space. Ride had led Grail's MoonKAM project, which allowed schoolkids around the world to pick out sites for Ebb and Flow to photograph. She died last July at the age of 61 after a battle with pancreatic cancer.